German-born Gottfried Krueger showed up in America in 1853, a 16-year old who stepped ashore wearing wooden shoes and knew not a word of English. He settled in Newark where his brewer uncle, John Laible, took him under his wing. 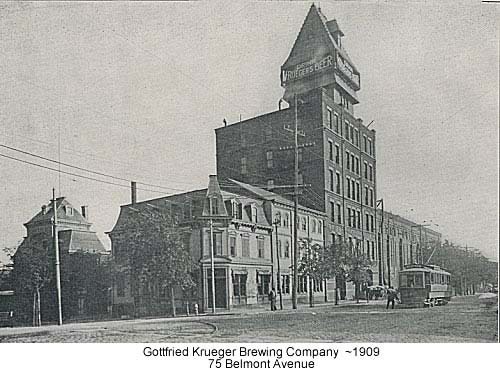 Together they founded the company that was to become the Gottfried Krueger Brewing Company in 1858. When Laible died in 1975 Krueger became sole owner. It was a business that would last for more than a century until it was bought out by Narragansett in 1961. Unlike his contemporary Peter Ballantine, there was no bungalow living at the brewery for Krueger. 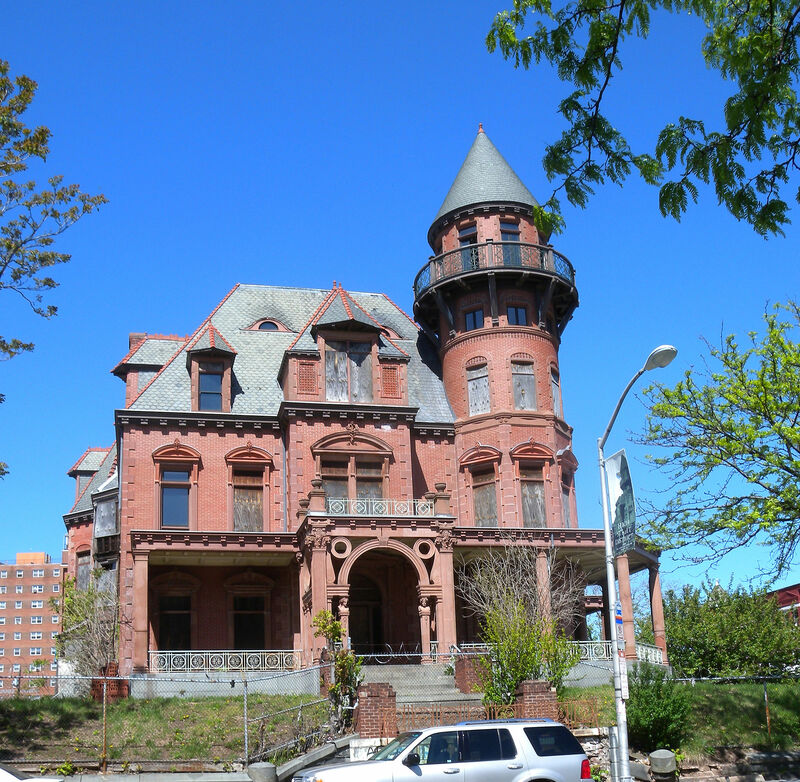 In 1888 he spent $250,000 on a High Street home that was heralded as the most lavish mansion ever built in Newark. In 1914 Gottfried and his wife Bertha set out for a trip to the homeland. It turned out to be a far longer visit than they expected. World War I broke out while they were in Germany and the Kruegers were trapped. To make matters worse, a character by the name A. Mitchell Palmer who paraded about as the “Great War Alien Property Custodian” seized the Krueger holdings. After the war ended Gottfried found his way back to Newark and was able to regain possession of his business and properties. He died in 1926 during Prohibition as his heirs tried to keep the business afloat by making soda. He never got to see his company make beer history when, in 1935, Krueger left its mark on the brewery business by introducing the first beer in cans. An 11-year old boy named Mendel Gassel left Latvia and arrived on these shores in 1911. His father had already preceded him, his mother and his four siblings and had settled in Reading, Pa. The family adopted the name Hassel and the Latvian Mendel became the American Max. Max Hasell would only live to age 32 but during that time he was alternately the “Beer Baron of Berks County,” the “Jersey Gentleman Beer Baron,” and a member of the legendary bootlegging Jersey Trio. Max got his start in Reading as an enterprising young man. He left school at age 14, worked for a while hawkling newspapers, then went into business with a friend making cigars. They eventually opened a retail cigar store. Then came Prohibition. The ban on alcohol was neither a religious nor a moral issue for Max, it was an economic opportunity and despite his young age he was quick to take advantage of it. Before long he had interests in three Reading based breweries, Lauer Brewing, Reading Brewing and Fisher Brewing. But unlike New Jersey, Pennsylvania took Prohibition seriously. In 1923 the feds raided Fisher Brewing after arresting one of its truck drivers, Max’s 19-year old brother Morris. Shortly thereafter, Lauer Brewing was raided and tax evasion charges were levied against Hassel. So the Beer Baron of Berks County crossed the Delaware. Hassel put down a stake in Camden by acquiring the Camden County Cereal Beverage Company. It was there that he utilized the common Prohibition era technique of piping beer in fire hoses through the city sewer lines to a warehouse while keeping only the low-alcohol near beer that he was licensed to produce at the brewery. Max Hassel was of the non-violent sort. At this point in his career he never carried a gun, nor did he surround himself with gun-toting thugs. History has crafted an image of Max Hassel as a fair-minded honest businessman, albeit in a dishonest business. Beer during Prohibition was not a gentleman’s game and Hassel would soon come face-to-face with that fact when a mobster from Philadelphia named Mickey Duffy paid a visit to Hassel and offered to become his partner. Max said no and shortly thereafter Duffy’s thugs came to Camden and physically tossed Hassel out of the Camden brewery. Hassel laid low for a bit then decided it was time to change tactics. He made a deal with Duffy, who wasn’t long for the world anyway. He moved to Elizabeth, setting up operations in the Carteret Hotel in 1929. He hooked up with a couple other successful bootleggers, Waxey Gordon and Max Greenberg, to form the Jersey Trio. These guys ran a network of 16 breweries. In addition to Camden Brewing, New Jersey holdings included Eureka Brewing (Paterson), Harrison Brewing, Rising Sun (Elizabeth), Union Brewing and Superior Manufacturing in Newark and Union City Brewing. The Jersey Trio may have been responsible for pumping more beer into the market during Prohibition than just about anyone. Their success however caught the eye of some high profile mobsters, including Dutch Schultz, It is believed that the hitmen who entered the Carteret Hotel on April 12, 1933, were hired by Schultz. Hassel and Greenberg were killed. Gorden escaped because he had skipped out to spend the afternoon with a prostitute in one of the other hotel rooms. Max Hassel was killed five days after prohibition ended. Later in the decade Paul “Frankie” Carbo was charged with the murders but he never made it to trial as all of the prosecution’s witnesses disappeared. Welcome to New Jersey Max! This entry was posted in History and tagged beer, bootleggers, gangsters, Gottfried Krueger, history, Jersey Trio, Krueger Brewing, Mas Hassel, New Jersey, Newark, Prohibition. Bookmark the permalink. 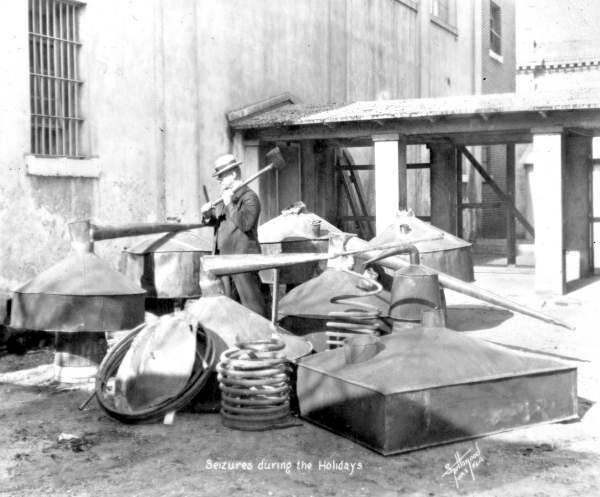 It is funny to think how prohibition created this thriving underground alcohol business. It is interesting to look back at a time when many states are finally making marijuana legal. I wonder what generations coming after us will think of our attempts to outlaw smoking. Anyway, any story that includes mobsters is a great story. Thank you for sharing. One of the things I found while doing the research on this is that during Prohibition doctors would prescribe alcohol as a treatment for nervousness. Sound familiar? I am always pulled to ‘rags to riches stories’. Despite the adversities, they pushed through to make a name for themselves and left a legacy for their future generation. How sad that Max Hassel was killed by mobsters, especially when he did not live a ‘dirty’ life. Such interesting stories from a very different time. Prohibition certainly was a big influence in people’s lives in so many different ways. You really have made the era of prohibition come alive in these stories. And who doesn’t love mob stories? Which was pretty much a direct result of prohibition, and the wheel goes round and round, eh? What was the point of Hassel being killed, if prohibition had ended? A great tale of the beer barons, I know living near the St. Lawrence River, there was a lot of smuggling from Canada in the US. Someday, I should tell you about an older friend who was in the Coast Guard, who did missions there. I guess gangsters acted like gangsters, Prohibition or no. Great stories. I love how you bring history to life. Prohibition was an interesting time. What an interesting post, and fantastic photos. Interesting how distinctive but similar to each other the brewery and the mansion. Quite the slice of immigrant history and a colorful era in US history. I think the details of people’s stories really brings it to live. In a roundabout way, this post brings to mind Eugenides’ novel Middlesex. The immigrant experience and prohibition are such rich times in American History. I’m wondering what happened to Max’s 19 year old brother Morris. Did he remain in jail until after Prohibition ended? Didn’t find any other information about him. Hopefully he outlived Max. I’m so enjoying these mini histories, Ken. The NJ Trio–sounds like they should be a jazz band. Prohibition was such an interesting time period–I mean, seriously, did people not smell the beer brewing? Fermenting? The froth on mustaches? Love it. For most people in New Jersey it was apparently a welcome smell. Doubt that Pittsburgh was much different. When public officials talk about “the rule of law”, it is important to recognize that law itself can be illegitimate: if X is “legal”, it doesn’t necessarily follow that X is “OK”. And when the law is illegitimate, illegitimate people and behavior tend to come out of the woodwork. Prohibition was a deeply illegitimate scheme that was cooked up by deeply un-American people who sought to run the lives of others; when Prohibition was over, these people should have been (at a minimum) forced to pay to the taxpayer the money that would have been collected if alcohol had been legal and taxed during the 1920-1933 period. I applaud Max for saying no yet it is unfair he did not get justice. Ahhh ya gotta love it! It’s interesting that Newark, Camden and Elizabeth were so prosperous. For such long time they were Jersey’s the three armpit cities .The image of the Krueger Mansion with the projects in the background, says it all. That sounds like the backdrop to a movie. Very interesting reading about “honest” men in a dishonest business. Truly had to have some adaptation skills and some grit. what an interesting post ken! Prohibition was definitely an interesting time.